Selecting fabric is my favorite part of decorating. quantities of white and beige. 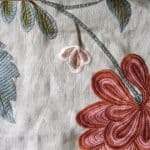 The embroidered Schumacher Palampore is being used judiciously (one large pillow) on the bed…very luxe and soothing. 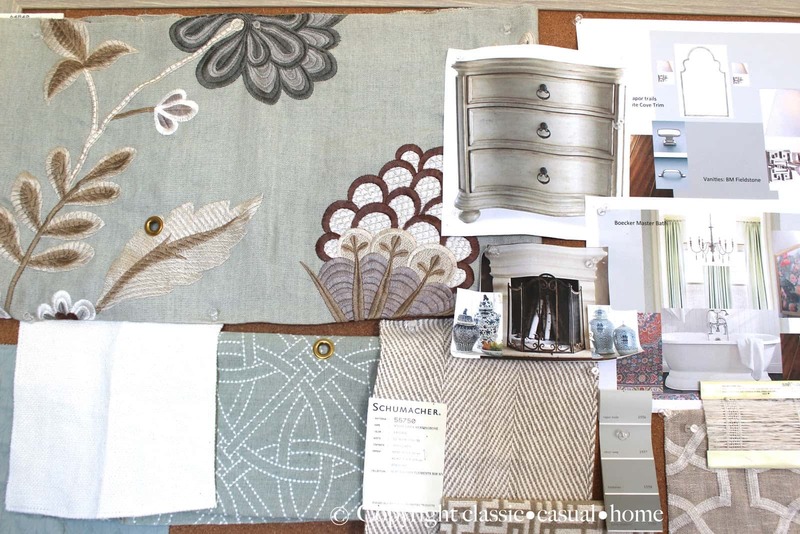 The Schumacher herringbone is going on an ottoman and two wing chairs…this will be a fun before and after. Lots of clients are in to blues and greens and I love it. A Dining Room in southern California. There’s that Kelly Wearstler Teal again on the right. 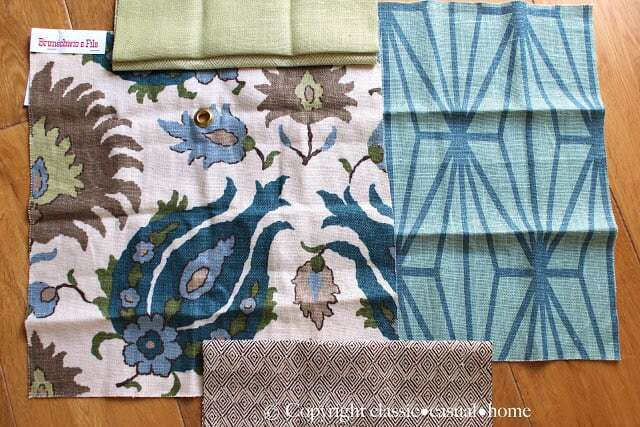 The diamond aqua linen in the center is from Peter Fasano…five yard minimum, but I love it. Hung the painting and PRESTO, a vignette ten minutes later. (Kelly Wearstler Katana Teal…just a thought?). you wouldn’t think I was very original, would you? Mary Ann, I am dying over that Southern California dining room combo. How fun! 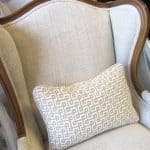 You are so amazing at choosing and combining fabrics! I can't wait to see the finished rooms. They'll be beautiful!! What a wonderful collection of fabrics, love those florals. Considering your painting, I could definitely see your Katana Teal on that chair. 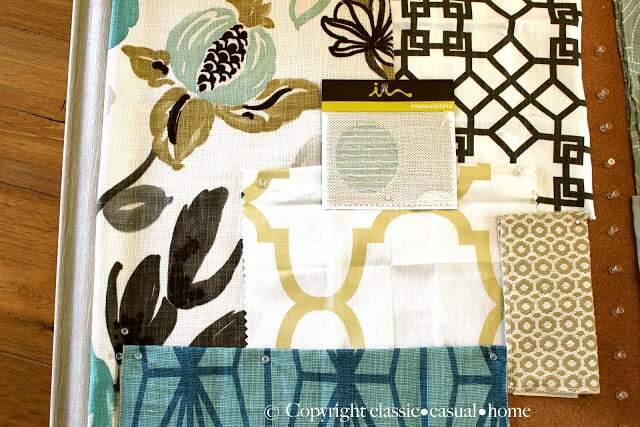 Mary Ann your colors choices are phenomenal and I can’t wait to see the rooms you’re using them in. Just your boards look wonderful. Mary Ann…you are the queen of beautiful fabric choices! Wow, you've been a busy lady and I know why….because you are fabulous at what you do! I can't wait to see the after pics. I have several rooms that need your attention! I'll be in touch soon! I'm digging the Palm Springs project! LOVE it. Lovely mood boards. I particularly like the duck egg blue. I am looking for some cushions in that colour for my daughter. 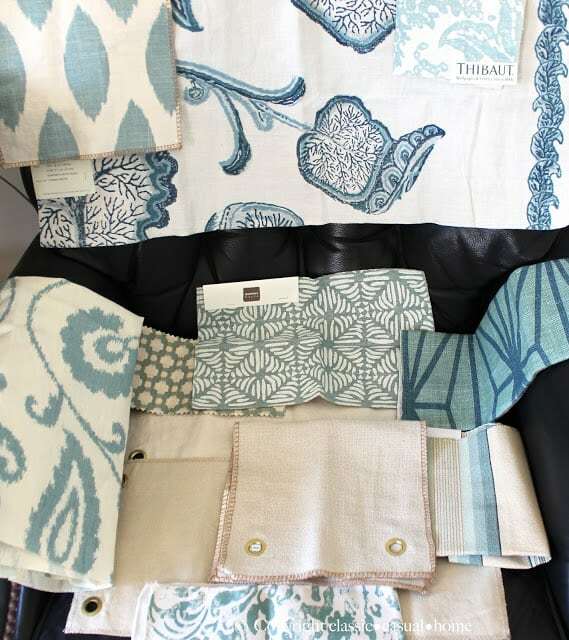 Mary Ann, love the selections of fabric…you got a great eye! Wow!!! Gorgeous palettes and very inspiring! Working on remodeling our master bedroom/bath and these are definitely the colors I am going with as well! Can't WAIT to see the finished rooms!!! Those linens at the tol are gorgeous…my favorite color palette! This will be beautiful and I can't wait to see it finished. Such beautiful fabrics! 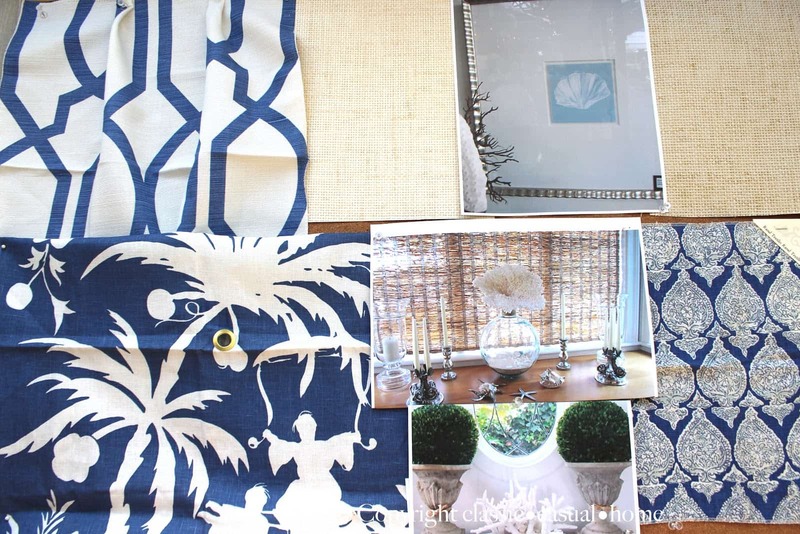 I am loving the Palm Springs fabrics too! You certainly have a lot going on these days. Can't wait to see the finished rooms (especially mine :)Grass cloth is going up next Tuesday. 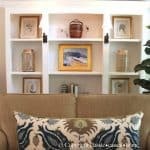 I just love the selections for the family room near the top. The floral and black & white geometrics is the perfect mix! Love every single board, Blues and greens are a fav. of mine, add a touch of black and white and I am so there! Great Job, Mary Ann. 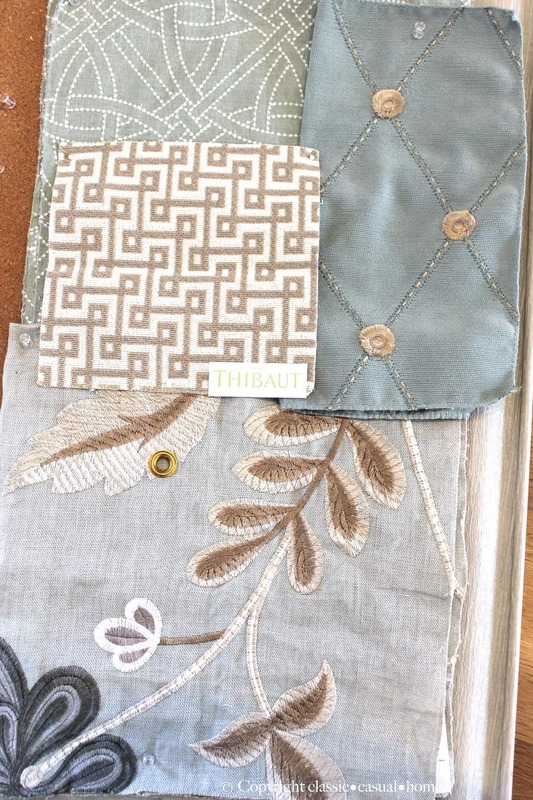 I'm such a sucker for fabric…love these choices – you're doing fabulous things! !…and yea, the K Werstler Teal is a total winner in my book!! Beautiful fabric combos you have curated here. What a wonderful collection of fabrics, love those florals. Considering your painting, I could definitely see your Katana Teal on that chair. thanks for sharing. 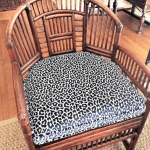 All fabulous fabric choices Mary Ann…I think the Kelly Wearstler would look great on that chair! 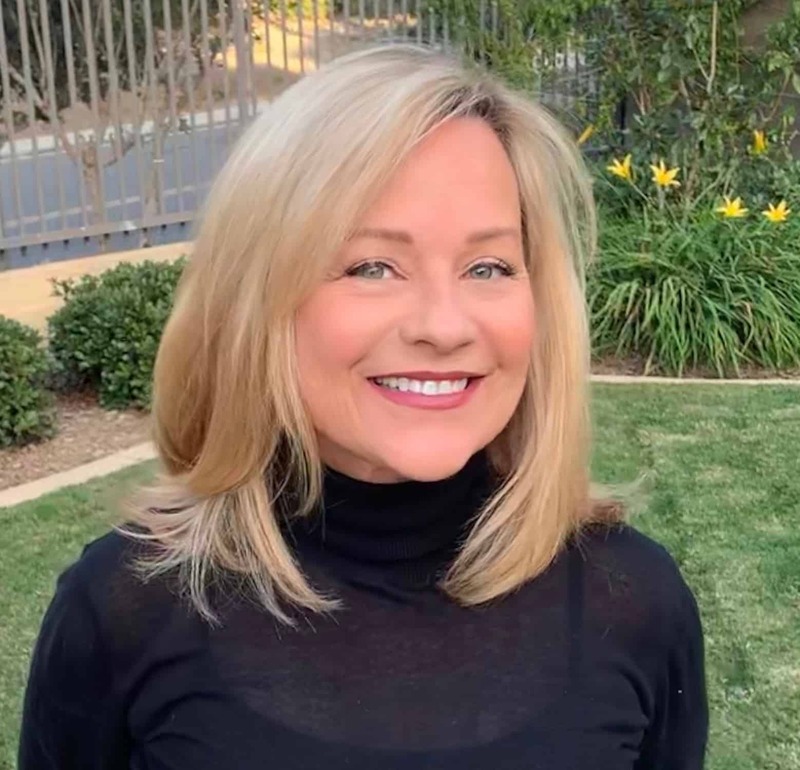 Mary Ann, you've made beautiful choices and your clients are going to be happy, happy people! Your choice of fabrics is impeccable. Can't wait to see that dining room! Loving all your choices! 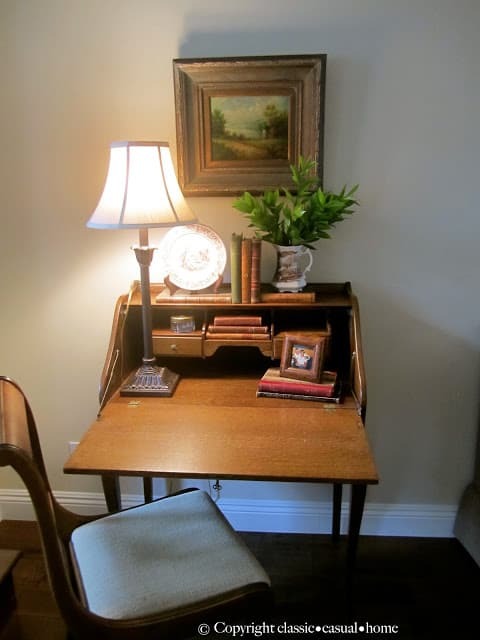 Gorgeous…I agree, a fun modern print on that chair would look beautiful. You have amazing style! Love every damn one of those plans! My colors for sure….love that you through in a special fabric for a pillow or 2!